Ever accidentally delete a file and then realize your mistake, for it to only be too late since you flushed it down recycle bin already? Or maybe you have experienced a dreaded computer crash and lost your important files in the process. In either case, you require a file recovery program for your best chance of getting your files back. MunSoft Easy Drive Data Recovery is one such data recovery program. Let’s see if it is worth your time. 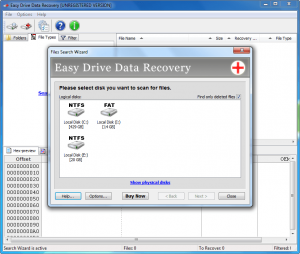 MunSoft Easy Drive Data Recovery is a program that allows you to restore your delete or lost files. It works on internal hard drives, external hard drives, USB flash drives, internal storage of a camera, etc. — anything that can be viewed in Windows as an explorable drive is supported by Easy Drive Data Recovery. Supports FAT16, FAT32, and NTFS drives — internal, external, USB flash, etc. Note: The inherent nature of file recovery means the name, size, and recoverability may not be 100% accurate. More specifically, when doing a ‘RAW search’ (i.e. a search for lost files) you won’t get file name or recoverability. The first (and easier) type is looking for files that exist in the file table of your file system. These are files that have been deleted in your current Windows installation. This type of scan typically very quick and only provides elementary-level file recovery. The second (and harder) type is looking for files beneath the existing file table. These are lost files that existed prior to a format of the drive/partition you are searching, e.g. files that existed prior to a reinstallation of Windows. Called ‘RAW scan’, this type of scan takes significantly longer than the previous type and provides an advanced-level of file recovery. Easy Drive Data Recovery performs both scans. When you select a drive or partition to scan, first the file table scan is run and immediately after a RAW scan is run. (You have the option to cancel the RAW scan, if you wish.) Once both scans are finished, you are shown the scan results along with found files. Found files can be viewed by folder and type, and each file has the following information about it: file name, size, type, time modified, time created, and recoverability. Take note the nature of a RAW scan does not allow for access to file name, may have the wrong size, and recoverability is always ‘unknown’. This is inherent to RAW scans and not a fault of Easy Drive Data Recovery itself. Files found via the file table scan will provide all six pieces of information but the file size may be inaccurate. When you have found the files you want to recover, you simply check their checkbox (you can recover multiple files at a time), tap the ‘Recover selected files’ button, select where you want to recover the files to, and let Easy Drive Data Recovery restore the files for you. Take note that not all files will be perfectly recoverable. That is simply the nature of data recovery. One thing I really like about Easy Drive Data Recovery is the fact that it is set, by default, to not display existing files (it will only display deleted or lost files), temporary files and folders, and overwritten files (file table scan only — this doesn’t apply to RAW scans because recoverability of RAW files is unknown). This helps cut down on the clutter while looking for files to recover. In terms of performance. I came away quite impressed with MunSoft Easy Drive Data Recovery. It scans fairly quickly (took about 20 mins to scan a 20GB partition) and it finds a nice amount of files (over ten thousand). To top it off, as per my tests, most of the files it found were recoverable. Of course, most of the files found were via RAW scan and not file table scan so I wasn’t given file names or recoverability, but still, the fact that it found so many files that can be recovered is a really good thing. (Note: How many files Easy Drive Data Recovery will depend on your specific situation. Data recovery is not a one-size-fits-all situation in which if I can recover files that means you can, too.) While I cannot quantify how well Easy Drive Data Recovery performs versus other programs I have used, qualitatively I have to say it is one of the better performing ones I have used. That said, however, there is one major (major) downfall to Easy Drive Data Recovery — the fact that it doesn’t support bootable media. Without the ability to create Linux-based or WinPE-based bootable CD/DVD/USB drive, Easy Drive Data Recovery must be run within Windows. When it comes to data recovery, it is always best to run data recovery outside of Windows simply because you don’t want to overwrite any files prior to recovering them. So not only does the act of using Easy Drive Data Recovery from within Windows minimize your chance of recovering files (because the files you want to recover may be overwritten while you are in Windows, intentionally or otherwise) but only being able to run Easy Drive Data Recovery also minimizes its usefulness. Confused? Let me explain. One of the major use cases for data recovery is hard drive failure or system crash. If this happens, that means you cannot boot into Windows. If you cannot boot into Windows, then how the hell are you supposed to run data recovery with Easy Drive Data Recovery? You would either need a second hard drive that you can put inside your computer, install Windows on, and then use Easy Drive Data Recovery from that second hard to scan the first hard drive; or a second computer in which you can pop the failed hard drive into to scan; or you would have to reinstall Windows onto your existing hard drive (the one on which Windows crashed), then use Easy Drive Data Recovery after reinstallation to try to recover the files that existed prior to reinstall. Neither of these situations are very user-friendly, especially the later scenario in which you risk overwriting (i.e. destroying) the data you want to recover by reinstalling Windows. Having bootable media mitigates all these situations. When I first started to use MunSoft Easy Drive Data Recovery, I thought it would be another one of those pathetic data recovery files developed by a kid in his mom’s basement. While I don’t know where MunSoft Easy Drive Data Recovery has been developed (it could, I suppose, have been developed in someone’s basement), I do know it is one of the better, more powerful data recovery tools I have come across. However, the fact that it doesn’t have the ability to create bootable media really mitigates the program’s usefulness. This is compounded by the fact that the developer wants $59.95 for the program. I’m not going to say $60 is a high price for recovering your precious files (after all, anyone will pay a measly $60 to recover the childhood photos of their children, for example) but $60 is a high price when the program doesn’t offer bootable media. Overall, it is hard for me to formally recommend MunSoft Easy Drive Data Recovery due to the lack of bootable media support. It is a good program, yes, but not a program I would spend $60 on. My recommendation is freeware Testdisk & PhotoRec . 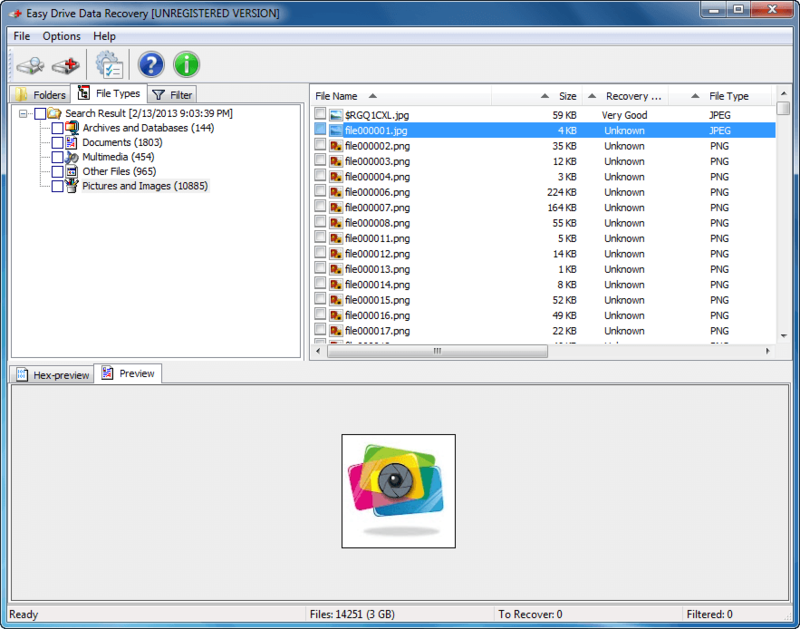 Testdisk & PhotoRec is not user-friendly but is easily the most powerful data recovery software I have used… and it can be run outside of Windows (i.e. it supports bootable media). Also be sure to check out dotTech’s review of best free file and data recovery software for Windows .